Flextone Game Calls, the maker of special hunting calls, is excited about their new product called the Black Rack™ and it nabbed Si Robertson of Duck Dynasty to be the spokesman on the latest commercial. The Flextone Black Rack dismantles the traditional method of using one full rack to create a rattling sound of two mature bucks going head-to-head for the right rain king of their doe’s. This rattling noise will attract other nearby bucks to come investigate who is fighting and what the prize is at stack. Flextone saw this as a flaw in that only using one full rack does not fully create the proper sound that will attract some of the big boys in the woods. To address this problem they developed the Black Rack which is made of two full racks designed for maximum long range sounds. Forged from Bone Core Technology for realistic rattling tone. They chose the color black to conceal movements. 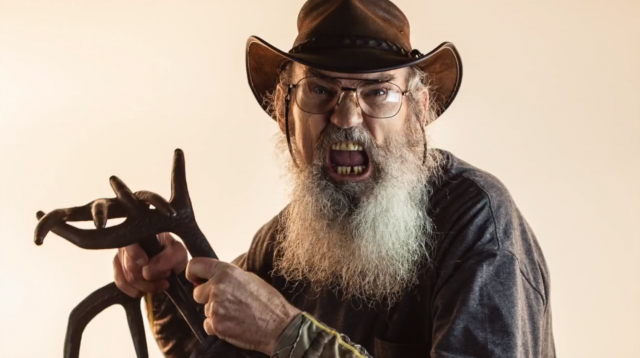 Watch below the hilarious video of Uncle Si showing how to rattle deer in the right way with the new Flextone Black Rack. Hilarity ensues with every new saying he comes up with.